The 1956 Aston Martin DBR1/1 is the leading car for the RM Sotheby’s Monterey 2017 classic car sale. Three further Le Mans participating Astons are on offer. 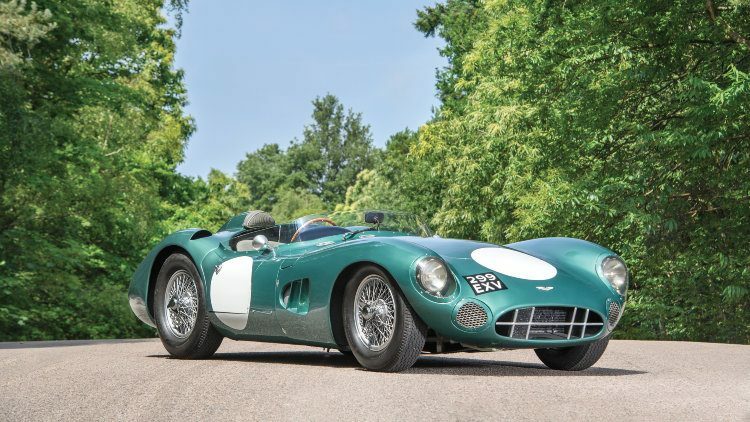 Note: This Aston Martin DBR1 sold for $22,550,000 as the most-expensive British made car ever. The top result at RM Sotheby’s Monterey 2017 classic car auction in mid-August 2017 is likely to be the magnificent 1956 Aston Martin DBR1/1. 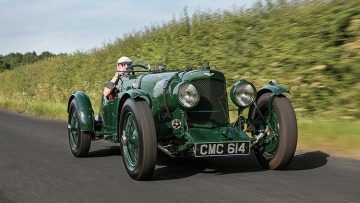 The estimate for arguably the most-important Aston Martin ever produced is “in excess of $20,000,000”, which will set a new marque record and potentially the most-expensive British car ever. This car participated in three Le Mans 24 Hours races but most-famously won the Nürburgring 1000 KM in 1959 with Sir Stirling Moss and Jack Fairman at the helm. It was raced in period by amongst others as Carroll Shelby, Roy Salvadori, Stirling Moss, and Jack Brabham. Three further Le Mans participating Aston Martins will be on offer at the RM Sotheby’s Monterey 2017 sale: the 1935 Aston Martin Ulster Competition Sports (estimate $2,500,000 to $3,000,000), the 1959 Aston Martin DB4GT Design Project (estimate $6,000,000 to $8,000,000), and the 2006 Aston Martin DBR9, (estimate $275,000 to $375,000). 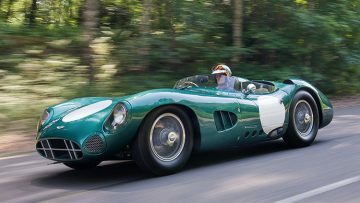 Note: DBR1/1 sold for $22,550,000 as the most-expensive British car ever. In 2017, RM Sotheby’s will have its Monterey sale on 18 & 19 August 2017 at the Portola Hotel & Spa in Monterey, California, USA. Around 100 cars will be on offer. RM Sotheby’s Monterey 2017 classic car auction will include a significant group of Aston Martin Le Mans participating competition cars. 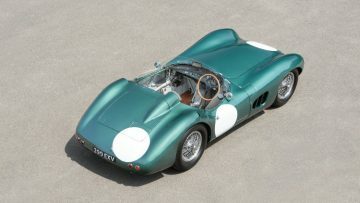 This exclusive group is led by first iteration of the most important Aston Martin ever produced, 1956 DBR1, chassis no. 1. Other top Aston Martins on offer include the DB4GT prototype DP199, a 1935 Ulster Competition Sports, and a semi-Works DBR9. The leading car for the RM Sotheby’s Monterey 2017 sale is likely to be the 1956 Aston Martin DBR1/1, estimate “in excess of $20,000,000”. Such result will set a new marque record: the current most-expensive Aston Martin ever is the 1962 Aston Martin DB4 GT Zagato that achieved $14,300,000 at the RM Sotheby’s New York 2015 sale. It may also challenge the current British record: the most-expensive British car ever is the 1956 Le Mans-winning 1955 Jaguar D-Type that achieved $21,780,000 at RM Sotheby’s Monterey 2016. The British marque’s legendary equivalent to the Ferrari 250 GTO and the Mercedes-Benz 300 SLR, the DBR1 was the result of David Brown’s dream to win Le Mans, a victory achieved by DBR1/1’s sister car in 1959. The first of just five examples built by the factory between 1956 and 1958, DBR1/1 was a purpose-built competition car developed by racing design chief, Ted Cutting. 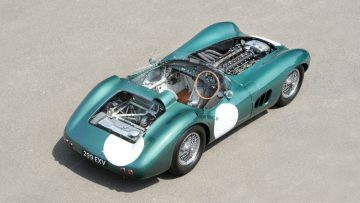 The DBR1 boasted a lighter, faster 3.0-litre engine than its DB3S predecessor, set into a small tube spaceframe chassis with an all-new rear end. The gearbox was replaced by the new semi-dry sump, five-speed transaxle, and the new racer was equipped with cast-iron Girling disc brakes with groundbreaking light alloy calipers. DBR1/1 debuted at the 1956 24 Hours of Le Mans at the hands of Tony Brooks and Reg Parnell, retiring after more than 22 hours with engine bearing failure. The car’s impressive list of Works entries that followed saw the who’s who of endurance racing behind its wheel, including greats such as Carroll Shelby, Roy Salvadori, Stirling Moss, and Jack Brabham. Entries included two more runs at Le Mans in 1957 and 1958, the 12 Hours of Sebring in 1958 and 1959, as well as three entries at the Nürburgring 1000 KM, in 1957, 1958 and 1959, the latter of which saw an overall victory with Sir Stirling Moss and Jack Fairman at the helm. 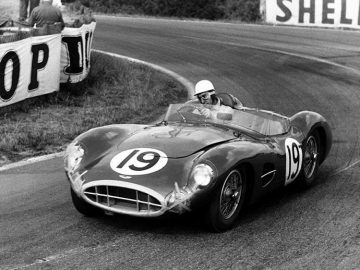 This marked the third consecutive win for Aston Martin and the DBR1. 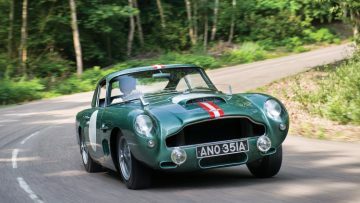 The win at Nürburgring also played a major role in securing Aston Martin the 1959 World Sportscar Championship victory—the first time a British manufacturer had done so. Nürburgring would mark DBR1/1’s final appearance as a Works entrant, but it would return under privateer Essex Racing Stable in both 1961 and 1962. The Aston was then sold to the Honourable John Dawnay, future Viscount Downe and Aston Martin Owner’s Club president, under whose ownership it saw considerable historic racing success in the early 1980s, piloted by veteran Mike Salmon. The car passed through another major collection, during which time it was awarded the Most Elegant Sports Car Trophy at the 2001 Pebble Beach Concours d’Elegance, before landing with its current owner. Immaculately presented down to every last detail, and the most correct of all five examples built, DBR1/1 is offered with its final Works fitted engine, and is currently equipped with a bespoke, completely correct reproduction engine manufactured by Aston Martin specialist Richard Stewart Williams. Following recent competition at Goodwood Revival at the hands of Brian Redman, DBR1/1 comes to RM Sotheby’s Monterey sale as the first DBR1 ever offered at public auction. The 1935 Aston Martin Ulster Competition Sports, chassis no. B5/549/U, estimate $2,500,000 to $3,000,000, is one of the best known and most original of the 21 Ulsters produced. As a Works-supported car, this Aston Martin Ulster campaigned in period at motorsport’s finest events. The Ulster ran the 1935 Mille Miglia, and secured a fourth in class finish at Le Mans that same year before winning the Targa Abruzzo in 1936. After having spent more than three decades as the personal race car of Derrick Edwards, founder of Ecurie Bertelli, it is presented in Monterey as a highly eligible historic racer, ready for the Le Mans Classic, the Mille Miglia, Goodwood, and the Monaco Historic Grand Prix. The 1959 Aston Martin DB4GT, chassis no. DP199 (Design Project), estimate $6,000,000 to $8,000,000, is widely considered the most important non-Zagato DB4GT. Significantly, DP199 took overall victory in its first competitive outing at Silverstone in 1959, with none other than Sir Stirling Moss as its driver, and was campaigned at Le Mans later that year. Following its Works career, DP199 passed through a string of privateers, seeing club racing action over the next couple of decades. Restored to its 1959 Le Mans specification, the DB4GT comes to Monterey representative of the beginning of the GT lineage. The 2006 Aston Martin DBR9, chassis no. DBR9/9, estimate $275,000 to $375,000, is another Le Mans participant. 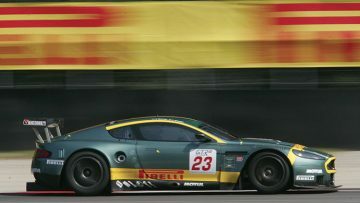 In 2006-2007, DBR9/9 was one of four chassis campaigned by Scuderia Italia BMS, operating under semi-Works status at the time. The car competed at the highest level, including at Le Mans and Spa. Seldom does an opportunity to acquire a factory race car arise, especially one with four FIA GT1 class podium finishes.